The mHealth lab is co-located in a beautiful space in 177 Huntington Avenue, at the edge of the Northeastern University campus closest to the heart of downtown Boston. The space includes our workspaces and the human-computer interaction lab. We are co-located with the research groups of four other faculty members working in personal health informatics, and one floor below many groups working in network science and health systems research. We are a short walk from Northeastern’s West Village H building, which houses the Khoury College of Computer Sciences and Northeastern’s Behrakis building, which is the home base for the Bouvé College of Health Sciences and houses the Exercise Science Lab and the Medical Simulation Center. The mHealth workspace supports the development of mobile health technologies. It is equipped with a suite of mobile phones, smartphones, and wearable sensing electronics. We have facilities and equipment for testing mobile phones and miniature sensors, including electronic shaker equipment, a variety of motion measurement devices (e.g., Actigraphs), tablet computers, consumer electronic fitness measurement devices (e.g., pedometers, scales), and an Oxycon Mobile portable calorimeter system. We also have sets of custom-designed and built miniature mobile sensors for the body and the home that are used in ubiquitous computing prototyping and experimentation, and a cluster of high-performance workstations useful for conducting applied machine learning experiments. The Exercise Science Lab has equipment for physical activity and sedentary behavior measurement. The mHealth group also has access to the Bouvé Exercise Science Lab, which can be used to test physical activity sensor systems. 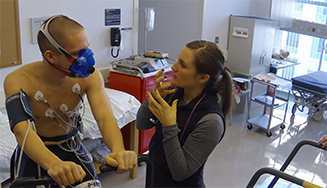 This lab has cardiopulmonary function and aerobic assessment equipment, body composition measurement devices, anaerobic power assessment equipment, skeletal muscle strength and endurance analysis equipment, and energy expenditure assessment equipment (including portable). 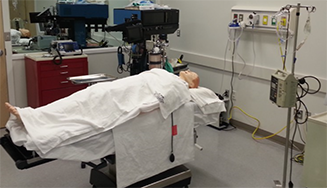 A patient simulator in the Sim Lab. The mHealth group also has access to the ​Arnold S. Goldstein Interprofessional Laboratory Suite. The facility consists of a set of transformable labs and debriefing rooms. Each lab can be set up as a variety of practice environments including, hospital rooms, operating rooms, exam rooms, office spaces, conference rooms, home care settings or even a dorm room. Each lab contains video and audio capture technology used to record student experiences as they interact with the latest high-fidelity human patient simulators, patient actors, faculty and other students. Recorded simulation experiences can be played back and analyzed during structured debriefing sessions.